We stayed in hotel horen in Kaufbeuren because Fabian’s house was full of guests already. The town was very quiet on Sunday morning. We walked around the old town and then joined fabian’s family for second breakfast. Our regional tour for the day began with a visit to the Wieskirche, a famous church decorated in the rococo style with painted ceiling, lots of gold and more cherubs than it was possible to count. There were a lot of tourists there and several restaurants but Schloss Neuschwanstein is the clear winner based on the traffic jam as an indicator. Inside the Wieskirche, an orchestra and choir were rehearsing for a performance that afternoon of Gounod’s Mass for St Cecilia so we stayed to listen for awhile, then had coffee and wieskucherl, a flattish doughnut (research purposes only). A thunderstorm and torrential downpour followed. We ended up in the Schloss traffic jam but fabian can do creative route finding in these situations. One of our goals was to find some proper bavarian stinky cheese. We stopped at a rather touristy cheese shop and factory and bought 3 varieties. Our final stop was at the premises of Herr Zxxxxx, a place known only to certain bavarians. Its precise location will not be revealed in case someone from the Lonely Planet guide is reading this. It’s an old farm house in a village and everything on the menu is really bavarian and quite cheap. 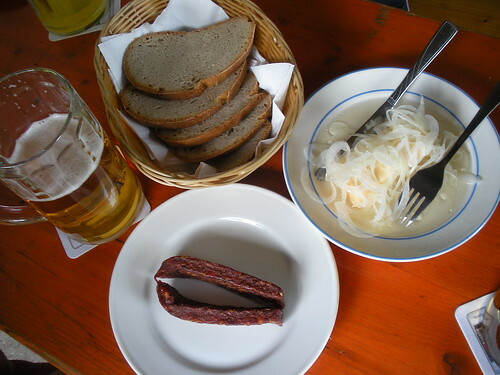 We ordered sauerkase – a piece of stinky cheese served with thin onion slices and vinegar. Also beer, sausage and bread. This was a pre-dinner snack. Fabian declared the cheese to be not stinky enough. We all had some. It was memorable. For dinner back in Kaufbeuren, Fabian and his girlfriend, Irem, made knudeln (dumplings made of cold cooked potato and flour with a crunchy crouton in the middle); bratwurst; gravy with mushrooms; potato salad; cheese; cherry torte with cream. This entry was posted on 11 August 2010 at 7:27 am and is filed under Germany. You can follow any responses to this entry through the RSS 2.0 feed. You can leave a response, or trackback from your own site.